It’s been sort of a funny trip home. I arrived last Sunday and slept all day. Then I spent two days in a whirlwind of cooking lessons – homemade dumpling wrappers, white tteok or sweet rice cake studded with black soybeans, and three kinds of kimchi, the classic baechu or cabbage, an easy dongchimi or cold water kimchi, and yeolmu or spring radish green kimchi. And then my mother and I left for Guam. We spent a few days there, a quick, quiet vacation before flying back to Seoul in time for Lunar New Year and the traditional bowl of dumpling and rice cake soup. My parents lived in Guam for over a year before I was born, and they vacation there fairly frequently, since it’s only 4 hours from Seoul. It’s sort of a surreal place. 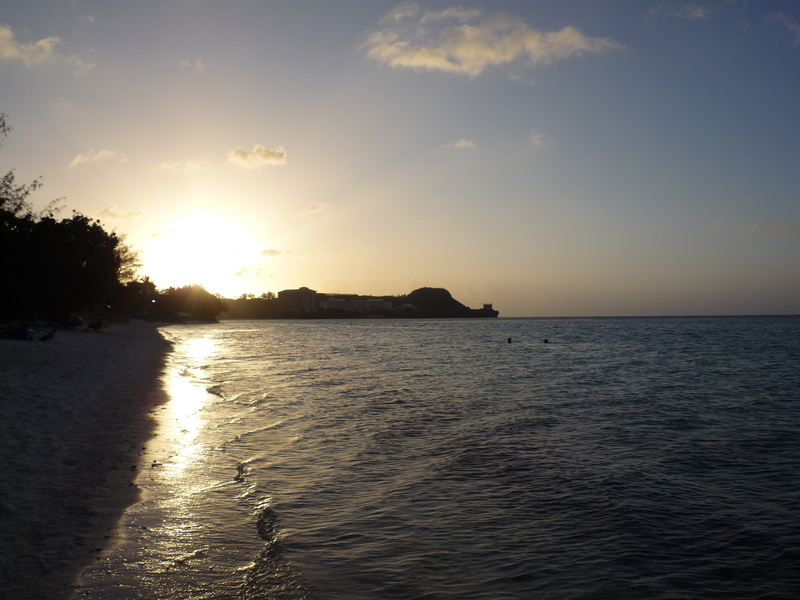 Most of the hotels, and the one we always stay in, are on Tumon Bay in the town of Tamuning. The beach extends in a wide arc, so that every hotel gets its bit of sand, with a public beach or two sprinkled in between. The main road, just a few feet from the beach, is lined with strip malls that advertise activities like “Oriental Pearls Massage,” and then, just a few blocks away, you’ll find giant luxury duty-free malls where you can buy $2000 Chanel handbags. Not all tourists are shopping for Chanel and Gucci. Many of them are, for some inexplicable reason, swarming the 24-hour largest Kmart in the world. Seventy-five percent of tourists to Guam are from Japan, which must be why the selection of Japanese tea-flavored drinks at Kmart is so impressive. Which brings me to the food. Unfortunately, I know even less about Guamanian food than Guamanian culture. We normally stay through a package deal that includes meals at the hotel’s buffet, and I let myself be led like a sleepwalker past trays of tough meat, cafeteria hash browns, limp sushi, and seafood with the consistency of wet tissue. I don’t care, either. I only care about being in the sun and running on the beach and reading trashy magazines by the pool. I did feel a glimmer of curiosity about Chamorran cuisine, the food of the indigenous people of Guam, but I couldn’t muster the energy to rent a car or figure out another way to go find some. In fact, the only meal we had outside of the resort was Korean. 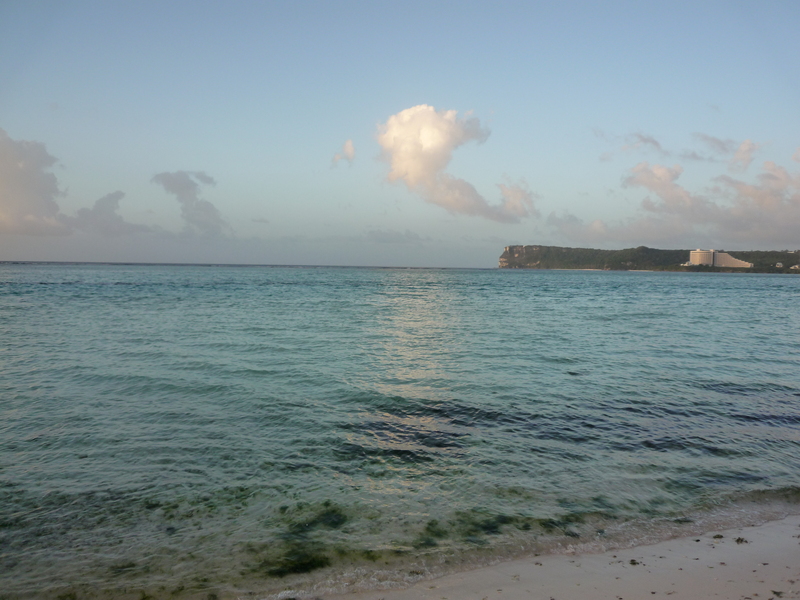 It’s not as strange as you might think, as there’s a sizeable Korean population on Guam and Guam is a popular travel destination for South Koreans. It’s not as strange as the time we ate Korean food in Las Vegas or worse, in Banff National Park in Canada. My mother, like most Koreans, loves Korean food more than anything else and feels sort of lost when she doesn’t eat it at least once a day. Which is why there is even a Korean restaurant serving extremely bad Korean food in the majestic Canadian Rockies. The busloads of Korean tourists who arrive there would die without their Korean food. We got one serving of galbi, marinated short rib, and one serving of gopchang, which is exactly what it looks like, beef intestines. 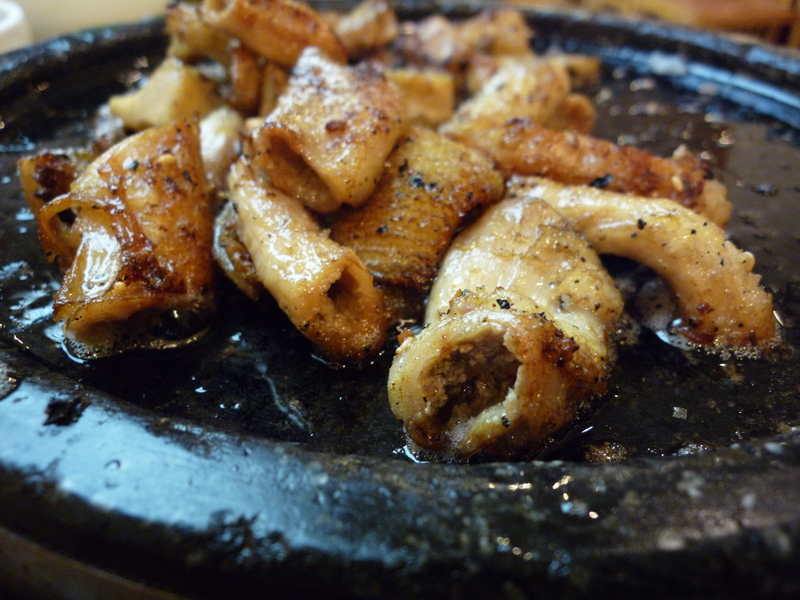 Gopchang and offal meat in general is very popular in Korea. It’s not considered “offal” and separate from other, more prized cuts. It’s another part of the cow people love to eat. Gopchang is so prized, it’s actually more expensive than galbi at Sejong. It’s surprisingly soft on your tongue, though it still has that cholgit-cholgit or chewy-chewy quality Koreans love. Grilled simply with salt and pepper, it tasted rich and smooth, perfect for wrapping with lettuce and soybean paste. The short ribs were also very good, nicely marinated and not overwhelmingly sweet. The soybean paste stew or doenjang-jjigae was serviceable, and my mother liked that they only had a couple of good, clean vegetable banchan, rather than the mess of tiny dishes New York restaurants tend to serve. My mother says there are other Korean restaurants on Guam, but this one is the best. So there you have it. 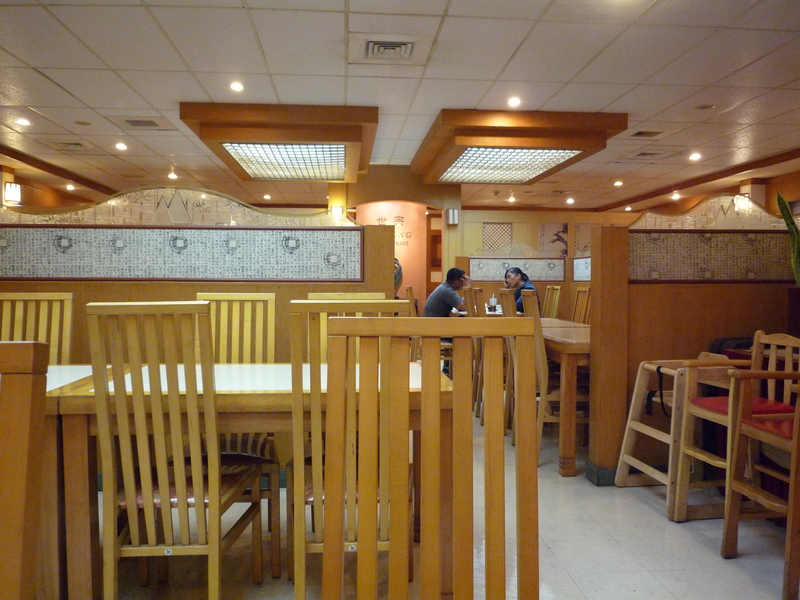 If you are ever in Guam and craving Korean food, you now know where to go. I’ll be back and blogging from New York by Monday evening. And before I forget, Happy Year of the Tiger! Apparently, February 14 marked the beginning of the Year of the White Tiger, a very rare occurrence, which the Chinese consider ominous and the Koreans consider auspicious. Take your pick. And if you don’t know your sign, you can find it here. It was Sunday evening. I had four short ribs, big meaty things. About 2.5 pounds worth after I trimmed most of the fat. I also had a lot of questions. Does Coke belong in galbi? Would kiwi really make a difference in tenderizing short ribs? Was it the pureed onion and apple that had made my galbi taste slightly muddy the other night? Or was it the thickness of the cut? This August, I’d taken advantage of my friends with backyards and grilled galbi, Korean marinated short ribs. Both times I’d been underwhelmed. The first time, there was clearly not enough soy sauce. The second time, the batch I’d bathed in Coca-Cola was tastier than the batch I hadn’t, but I wasn’t sure if it had to do with the marinade or the quality of the beef or even how thinly it had been cut, since the two batches of ribs came from different sources. The weather had finally cooled down and I felt energized, rejuvenated. These were questions that had to be answered and soon, while the taste of Saturday night’s ribs could still be remembered. Galbi or 갈비 is the Korean word for beef short rib, one of the most beloved cuts of meat in Korean cuisine. “Galbi-gui” means grilled short rib, and even though Koreans love to grill all kinds of things, “galbi” has become synonymous with “Korean barbecue” around the world. Galbi is often eaten plain and without marinade. Even though it can be a tough cut of meat, Koreans highly value chewiness, and those who really love meat know, like all meat-lovers around the world, that the best way to eat the best meat is unadorned. But when people say “galbi,” they normally mean the marinated version. Short ribs are marinated for up to 24 hours in a mix of soy sauce, sweeteners, sesame oil, garlic and green onion that both tenderize and flavor the meat. Galbi can be broiled in the oven, but grilling, especially over charcoal, brings out the best flavor. The fat drips off the meat, the sugars in the marinade caramelize, and you end up with some of the best summer barbecue eating in the world. The classic, original cut is a butterflied short rib, where the big hunk of meat attached to the bone is cut and rolled out until you’re left with a thin, long strip of beef attached to the rib. This is what you’ll usually find in Korean restaurants, both in Korea and in the U.S. The cut that Koreans have adopted as their own for home cooking, though, and increasingly easy to find is flanken or “LA style,” presumably because Korean immigrants in LA found this cut more readily than what they’d had at home. In this cut, the ribs, which are still attached together, are cut cross-wise, so that each thin slice of meat has three bones attached. This cut doesn’t require any extra work for the home cook, and they’re very easy to lay on the grill and flip. Korean groceries will often also sell boneless short ribs, which is the worst kind of oxymoron. The exact proportions are a matter of taste. And this is where my questions lay. In all the recipes I saw, the variations seemed to be in what was added to the soy sauce, sesame oil, garlic, green onion and sugar. One cook extolled the clean, neat flavor of adding nothing more. Others added everything, honey, pear, onion, mirin, Coke, and kiwi. I had used LA-style ribs for my cookouts, but for this experiment, I was too lazy to bike to the butcher, so I picked up some regular meaty short ribs at my coop and decided to butterfly them myself. Not so pretty, but good enough. Each rib was then assigned one marinade and placed in a labeled Ziploc bag. Rib 1 got just a quarter of the base sauce. Rib 3 got a quarter of the base sauce plus ¼ cup of Coca-Cola Classic. Finally, Rib 4 got a quarter of the base sauce plus ¼ cup of Coke and a teaspoon of pureed kiwi. Putting in that bit of kiwi was almost terrifying—what would I find the next morning? From left to right, Rib 1 to Rib 4. I let the four little baggies marinate in the fridge overnight. The next day, I broiled them all at once, 5 minutes on each side. I also roasted the rib bones separately in a 400 degree oven for 25 minutes, flipping them halfway. I wasn’t going to waste all that delicious fat, tendon, and gristle! But the most important part, of course, is which rib won. At least it was for me. If I’d had more forethought, I would have invited my other friends who work from home for lunch. The only other taste tester was Ursa the Dog, and she doesn’t know how to talk. Still, I’m pretty confident in my winner. The muddy flavor that I’d found when I’d just thrown in the fruit/onion puree was completely gone. Instead, there was a mellow sweetness, a smooth but light flavor that went very well when wrapped in a piece of crisp lettuce with my spicy bean-paste ssamjang and a bit of rice. Rib 3, which had coke added to it, was my second-favorite. It was tasty, though it just didn’t taste as balanced as Rib 2. I’m still curious to know how galbi would taste if coke were added to the mixture in Rib 2. I’m feeling much more open-minded to High Fructose Corn Syrup Flavored Soda Made by The Man in my galbi marinade than I used to be. Rib 4 was a tad tenderer than the other ribs, which I’ll attribute to the kiwi. But the acidity cancelled out the sweetness of the soda and sugar, making the soy sauce flavor much stronger. If you do want to add kiwi, I would add another tablespoon of sugar. I also didn’t think the kiwi made it so much more tender that it was crucial, but I am a girl who really likes her meat to have some chew. Rib 1 was my least favorite. The soy sauce flavor was much too strong and it was all I could taste. There was, however, a noticeable difference in flavor between these four ribs and the ribs I’d made for my friends. The first dinner, I’d used pre-cut LA-style ribs from Assi Plaza in Flushing. The second dinner, I went to Los Paisanos in Cobble Hill and got good quality “all-natural” meat, for what it’s worth, that they cut to my specifications into LA-style ribs, as well as some ribs from a Korean store of unknown quality. For this experiment, though, I used grass-fed beef from McDonald, a New York State beef supplier for the Park Slope Food Coop. I love gristle and tendon so much. I’m not one of those people who think everything labeled “grass-fed” tastes better and sends you to heaven at the same time. It’s possible that the cut, despite my clumsy butterflying job, was more critical in affecting the flavor. It just gives you more to chew than the thin LA-style. Regardless, my broiler-batch at home definitely tasted better than the galbi I’d grilled at Mimi and Alex’s and at Ryan and Ellen’s. I’m sorry, friends, that you weren’t at home with me to taste these ribs! Phew, long post! 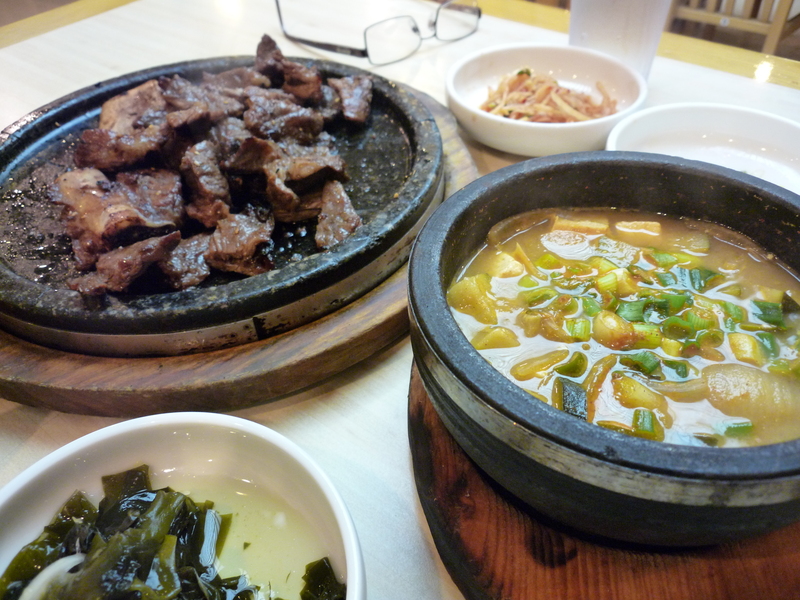 Despite my pontificating, I’m still not really sure what makes the best galbi. But next time, I think I will buy meaty ribs, butterfly them myself, trim the fat a bit more closely, and then marinate them in a mixture of pureed and strained Asian pear/onion and mirin, along with the soy sauce, sugar, garlic, green onion, sesame oil and sesame seeds. If the quality of the meat is a bit off, I will likely add another tablespoon of sugar. In general, I’ve found that the marinade at the outset has to be slightly sweeter than you want the finished product to be. All the marinades were noticeably sweet; none of the ribs were cloyingly so. So if you like sweeter galbi, you definitely have to add more sugar/coke/what have you than I did. And in case you’re wondering, I did not eat all two-and-a-half pounds of ribs for lunch. I had a nice lunch and the dog ate a bit, though not too much as her owner had exhorted me not to let her get fat while he was gone. The leftovers went in the fridge. Don’t feel too sorry for her, though. She’s sleeping as I type and smacking her lips as she dreams. I took the bone away when I realized it could splinter, but she enjoyed it for awhile.